In this study, we show that composition shifts of ammonia oxidizer communities imposed by a 22-year field fertilization regime could be well retained in both fresh and air-dried soils. The abundance and composition of ammonia-oxidizing bacteria (AOB) and archaea (AOA) were measured in fresh soils, which received no fertilization (CK), chemical fertilization (NPK), and chemical plus organic matter fertilization (NPK/OM) for 22 years. The air-drying treatment of fresh soil was also conducted for pairwise analysis. We found that in fresh soils DGGE fingerprints of AOB showed significant changes under both NPK and NPK/OM treatments when compared with control (CK) and that microbial shift was almost identical in air-dried soils. Long-term nutrient fertilization did not affect AOA communities in either air-dried or fresh soils. Compared to CK treatment, real-time PCR indicated that AOB amoA genes increased significantly in fresh soils of NPK (59-fold) and NPK/OM (48-fold) plots and in air-dried NPK and NPK/OM soils by 22-fold and 19-fold respectively. Our results demonstrate that community shifts of AOB in fresh soils under chronic N fertilization could be well preserved in air-dried soils, despite the apparent decline in absolute abundance of ammonia oxidizers. 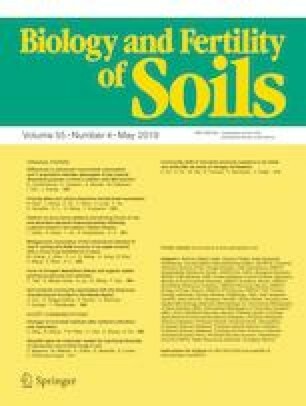 These results suggest that air-dried soil could be a useful resource for deciphering the adaptive strategy of ammonia oxidizers under N enrichment when the significant changes of community composition occurred in fresh soils. The online version of this article ( https://doi.org/10.1007/s00374-019-01352-z) contains supplementary material, which is available to authorized users. We thank Prof. Penny Hirsch for constructive comments and suggestions. The authors also want to thank Dr. Yucheng WU, Xue ZHOU, and Baozhan WANG for technical support and the members of our lab for helpful discussion. This study was financially supported from the National Natural Science Foundation of China (41530857, 41501267, 41471208); the State Key Laboratory of Soil and Sustainable Agriculture, Institute of Soil Science, Chinese Academy of Sciences (Y20160025); and the Strategic Priority Research Program of the Chinese Academy of Sciences (XDB15040000).